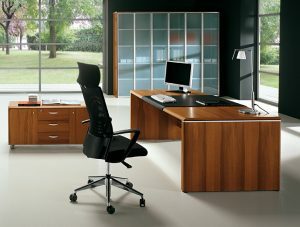 An environmentally friendly office is of course a wonderful thing to have for environmental reasons. It also helps considerably in presenting a brand that cares; in demonstrating responsibility and also in attracting the right type of new blood into your organisation. 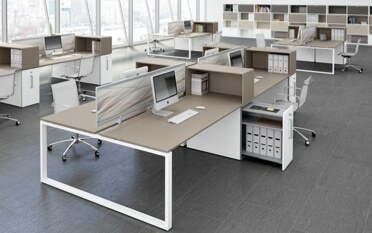 If you are thinking about an office refit, going down the eco-friendly route could help you enjoy numerous benefits. Wondering how to go about it? Read on! 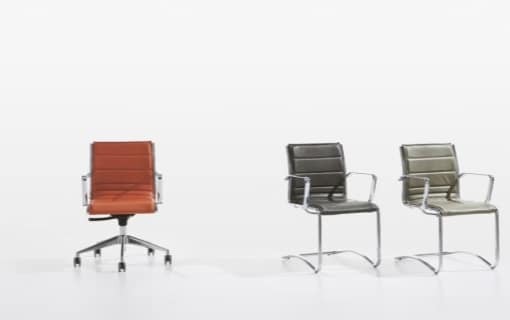 Your selection of office furniture for an eco-friendly workspace will need to be carefully considered. It’s time to start taking an interest in where your furniture actually comes from. 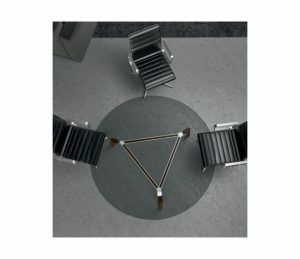 If you are opting for furniture made from timber, it is wise to check the reputation of the manufacturer and look into their own environmental policies. 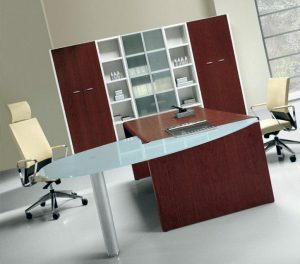 There are many responsible office furniture manufacturers that will follow certain world standards governing the promotion of responsible forest management, such as those of the Forest Stewardship Council® (FSC) for example. Choosing veneered furniture rather than solid wood is ecologically kinder. Veneered furniture is both strikingly beautiful and robust. Instead of using entire logs to make pieces, thin layers are cut from the logs and then glued to a substrate. Wood veneers are often visually more appealing than solid wood because of the way the logs are sliced and then matched so that the grain flows perfectly. Often you’ll see stunning, natural effects within veneered furniture that really set it apart. 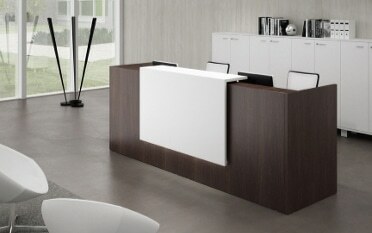 Particularly striking for reception areas and boardrooms too! 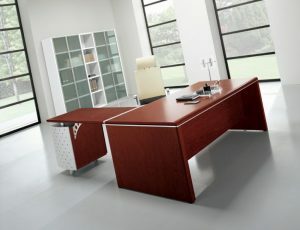 The Zeus Italian executive desk for example is a fine looking desk with matching boardroom and meeting tables available. Even the desk mat is eco-leather. 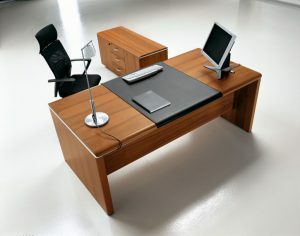 You could of course always opt for non-timber office furniture. 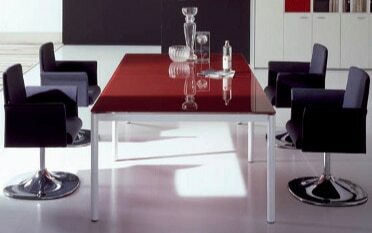 The meeting tables in the Rail Italian range are available in glass and eco-leather. Natural light is the aim of the game where any eco-friendly office is concerned. The more daylight that flows in, the fewer resources you will need to use to create artificial light. Natural light is also vital for plants, which let’s face it, in an environmentally-focused office you are going to have plenty of! If your office is situated as such that too much heat and sunlight filters in, specially designed curtains or blinds that allow in just enough light but keep heat out will help to prevent hindered vision and the need for over-doing it with the air conditioning. Natural light is a known method of boosting morale and workplace mood too, so if you get the lighting right, you’ll be enhancing productivity. As it starts to get dark, the use of energy saving LEDs instead of traditional lightbulbs will save valuable resources. Aside from saving energy, LEDs also keep the workspace at the ideal temperature. Finally, make it a policy amongst your workforce to switch off lights when leaving a room. Even if they’re just popping to grab a coffee, five minutes of lights off a few times a day can make a considerable difference in the long run. Eco-friendly air conditioning and heating systems are available. Some of the features include automatic temperature control and auto switch off when the system detects that no one is in the office. Many can be controlled remotely too via smartphone apps, so if you are out of the office and there’s an unexpected rise in temperature, you can elect to turn the heating down or off whilst you are away. Of course, the choices you make will be based on the fabric and structure of your building. What is energy saving for one premises may be the opposite for another. Where possible though, you may consider things like biomass boilers which put out lower carbon emissions than traditional gas boilers, or heat pumps which repurpose energy in the earth or the air as useful warmth. You will need to consider though that some of these options, whilst energy and therefore money saving in use, can command a fair capital investment to install. Before you even think about the physical aspects of waste management, the first step is to introduce a waste management policy and make sure your staff are aware of the advantages of reducing waste and using the right waste outlets, i.e. organic, recycling and general waste. Introducing individual bins that are clearly labelled will go a long way to helping the environment by reducing general waste and giving recycling a boost. Education is always key though, so be sure to share knowledge and monitor how everyone’s doing. Finally, any truly eco-friendly office has got to have some element of nature brought into it. Whether it’s plants around the office that are cared for by staff to give them a sense of responsibility, or an outside area or living roof where staff can go for a relaxing break, the fact is that anything green you have in your workplace will greatly benefit the environment, both inside and out. Make Your Office Green with the help of Tag Office! 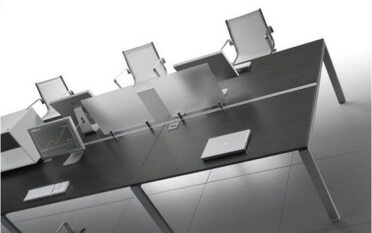 Tag Office is a nationwide supplier of exceptional quality office furniture including numerous ranges that can fit in with the eco-office theme such as veneered wood desks. If you are looking to fit out your office with options that are kinder to the environment, why not get in touch with our helpful team? We’re at your service with bespoke advice and inspirational guidance. We look forward to hearing from you! 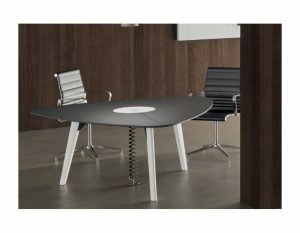 Posted in Italian Office Furniture, Office Desks, Office Seating, Office Storage and tagged eco friendly office, eco friendly office design, environmentally friendly office design, office furniture on 15th June 2018 .